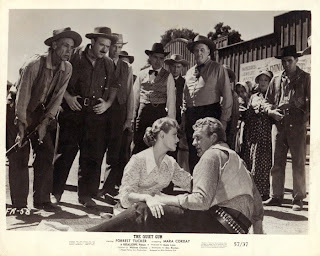 Forrest Tucker is excellent in the Western THE QUIET GUN (1957), released this year by Olive Films on DVD and Blu-ray. I watched the DVD version; it's a gorgeous print of this widescreen black and white Regalscope film from 20th Century-Fox. Western fans should make haste to snap this one up. 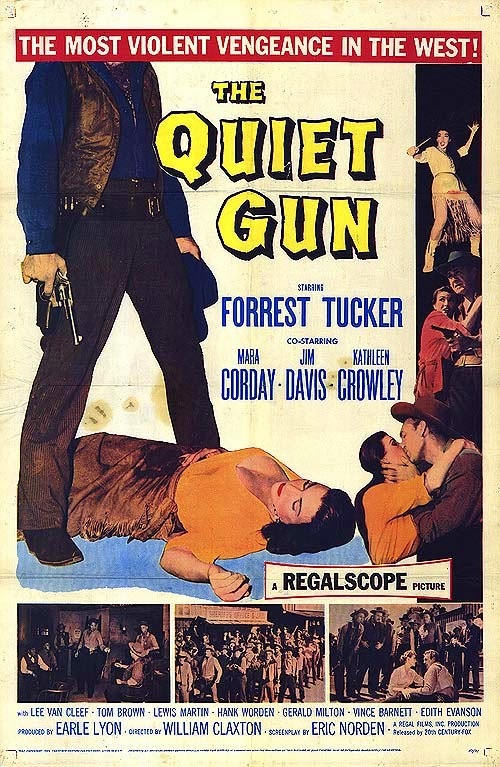 THE QUIET GUN echoes earlier films in the Western genre such as HIGH NOON (1952) and TOP GUN (1955). Tucker plays world-weary Sheriff Carl Brandon, an honorable man who sometimes seems to battle the unsupportive citizens of the town of Red Rock as much as he does the bad guys. 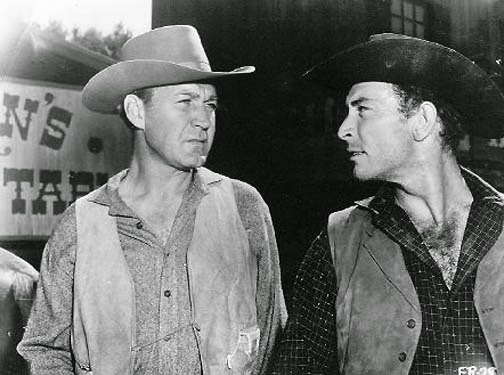 Carl is keeping his eye on nasty Doug Sadler (Lee Van Cleef), who has just arrived in town and promptly tormented the slow-witted but kindly man at the livery stable, Sampson (Hank Worden). Carl has no sooner broken up that conflict than town attorney Steven Hardy (Lewis Martin) demands that Carl go investigate his friend Ralph (Jim Davis). It seems that Ralph's estranged wife Teresa (Kathleen Crowley) has been away on an extended trip, and Ralph has a young Indian girl (Mara Corday) keeping house at his ranch. Hardy wants Carl to arrest Ralph for indecent behavior or some such thing. Meanwhile, Teresa happens to arrive back in town on the afternoon stage. Carl, as it happens, is Ralph's best friend -- and Carl also harbors unspoken love for Teresa. Carl attempts to defend Ralph to the town's small-minded citizens but they're having none of it, and when Hardy goes out to Ralph's ranch to deliver a warrant and pulls a gun, Ralph shoots him dead. It may well have been self-defense, but now the town wants Ralph to hang. Carl, meanwhile, senses there's something funny going on with the whole business -- why the big push by others to get Ralph off his ranch? He's got his hands full trying to solve that mystery along with bringing Ralph in for trial, and there are more problems yet to come. 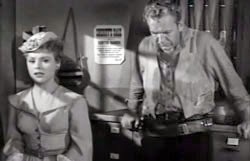 Forrest Tucker continues to rise in my estimation; it took me a while to warm up to him, but performances in films such as CALIFORNIA PASSAGE (1950) and FLIGHT NURSE (1953) won me over. He's simply outstanding in this, tired and frustrated but a man who won't ever back down from doing what is right. It's a performance which requires close attention, as so much of his character's feelings are expressed without words; for instance, watch his hands when he's around Teresa, and the times he starts to reach for her but then stops himself. I also loved the scene early on where Carl goes in the saloon and just eyeballs Sadler (Van Cleef). You can see the measure of the man in that moment. There's also a beautiful sequence near the end when Carl rounds up the town council and finds a way to appeal to their better instincts to help him hold off a lynch mob. He takes a gamble in that moment, with a nice payoff. Davis, Van Cleef, and Worden offer strong support, all having moments of excellence. Worden plays his typical silly "character" but he's delightfully sweet as a man who proudly supports the sheriff come hell or high water. The cast also includes Tom Brown, Vince Barnett, Gerald Milton, and Edith Evanson. 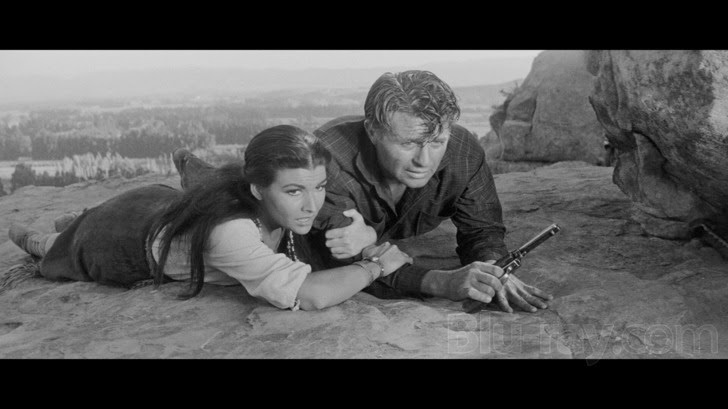 This 77-minute movie was directed by William F. Claxton, who's more closely associated with directing TV Westerns such as BONANZA and THE HIGH CHAPPARAL. He did very good work on this film. I especially liked the economical staging of a violent scene, which completely avoids being graphic yet has more dramatic impact than actually showing the event. It's a brilliant little "less is so much more" moment. The movie was beautifully filmed by John Mescall. Though the company never went further on location than Iverson Ranch and Corriganville, it's a very good-looking Western film, shown off to great effect on the Olive Films disc. As a side note, some of the film's publicity shots of Tucker and Corday together in romantic poses are completely baffling! No such thing occurs in the film. Regular readers know I review a great many Westerns, and I enjoy most of them to varying degrees. Among those films, I thought THE QUIET GUN was something special. Highly recommended. Read your review and have just ordered the DVD. Don't know this western but it sounds good. I'm so pleased to have read your excellent review and to see how much you clearly found to appreciate in this fine western. I have only so far seen the pan-and-scan horror of it and yet, even from that, I took away what a fine and really quite powerful little film it is. Cast is really good, Tucker and Davis especially. Now I have my Olive Films copy to watch and your review prompts me to push some other things aside and get to it right now! Couple of days ago I did pull out my new beautiful WA copy of "THE HIRED GUN". Another one I had only seen in a p&s off-air version years ago. This has been a revelation - yet another really fine Rory Calhoun western with beautiful Lone Pine locations and terrific pacing. It covered all it needed to do in just 65 action-packed minutes. The depth and contrasts of the beautiful monochrome photography I found simply stunning. (And by the way, referring back to previous thread about hats - Rory always wore terrific hats too, and few wore them better!). I thoroughly support your high recommendation of "THE QUIET GUN". One not to miss! Thanks so much for sharing your thoughts on THE QUIET GUN, Jerry! I was so taken with this one. I'd love to know what you think of the experience seeing it in a beautiful widescreen print. :) Thanks so much for adding your recommendation. It's always a treat to discover a Western like this for the first time, so solid and well done. Delighted to hear how much you enjoyed THE HIRED GUN. That one went by so quickly, I'm tempted to watch it all over again soon. I'll be looking out for Rory's hats more in the future! Keep up the great work Laura! Brad, I'm so delighted to have you also post your strong endorsement of the film here -- with you and Jerry contributing your thoughts, it's great to know it wasn't just me who responded so strongly to this movie. Worth noting that the opening credits are *not* windowboxed on the DVD version, only the Blu-ray. More often than not I will still buy DVDs, rather than Blu-rays (price, versatility when it comes to players, being quite happy with DVD quality). In this case I'm especially glad I went with the DVD as the credits look as terrific as the entire movie. I wonder what prompted the Blu-ray windowboxing? I've heard that complaint from more than one person. If they put out COPPER SKY I'd probably preorder it the very first day I could, that's how much I want a really nice widescreen version of that film. Such a wonderful performance by Coleen Gray. Thanks for stopping by and sharing your take on THE QUIET GUN and Forrest Tucker, Brad! 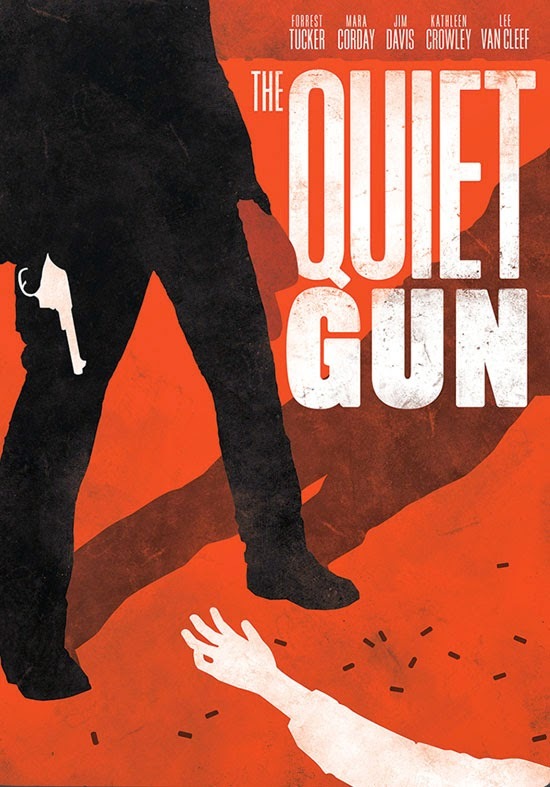 Just watched The Quiet Gun based on your recommendation and agree it is very good . I liked the slow way it developed and the way the sheriff got councilmen to get behind him. 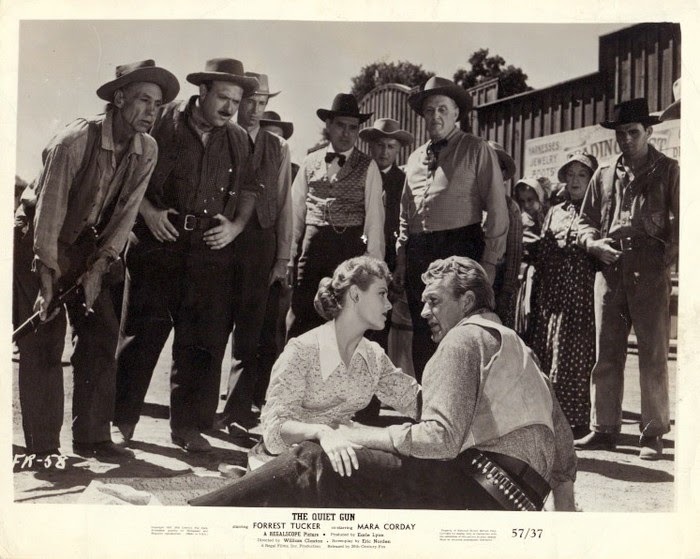 Also good to see Jim Davis in a sympathetic role, very rare for him in the 50s westerns. And a nice change of pace for Tucker,quite different from most of his roles. thanks for bringing this one to the fore. I'm so glad you were able to see this film so soon and more importantly that you enjoyed it as well! There was so much to like about this movie. Thanks for taking the time to share your feedback! Hi Laura: So glad you were able to catch up with THE QUIET GUN; along with CALIFORNIA PASSAGE and ROCK ISLAND TRAIL, the Forrest Tucker films I've most often recommended. (BARQUERO, one of his finest supporting roles, also came out on DVD and Blu in late April, and also stars Lee Van Cleef and Warren Oates, but be warned, it is a very violent, WILD BUNCH-inspired 1970 Western--Tuck is great in it though) I noticed the same thing you did regarding how much is communicated wordlessly in the film; people recognize that same quality in THE MAN WHO SHOT LIBERTY VALANCE, but THE QUIET GUN did it five years earlier.